Married mama of five (and a half) crazy monkeys... hairstylist, makeup artist, wedding coordinator... and now blogger! I am beyond excited to share my life with you and have you share yours with me! Send a message, leave a comment, connect with each other! There is no community without connection! We respect your privacy and pledge to never misuse your information! Thank you for joining the Champagne Campaign! I have seen Finding Dory at least 20 times in the last week… possibly more. As a part-time stay at home momma I can tell you that this fact almost brings tears to my eyes. I used to love this movie… I used to enjoy watching it… but this morning I was begging my toddler to choose something else, ANYTHING ELSE! I remember my older kids doing this. My 13 year old wore out his Cars DVD so much that I had to replace it. My daughter was slightly less picky and would settle for any episode of Veggie Tales that I could find. In conversation with other moms I hear the same consoling groan when I talk bout this topic. It’s a mind-numbing broken record of sound every day. I started to contemplate why this happens. Why can we not watch Nemo? Or The Reef? Or Splash and Bubbles? There are plenty of other fish movies, come ON already!! But for my little munchkin it’s not about the fish, it’s about predictability. So much of our young one’s lives are unpredictable in their eyes. Watching the same thing over and over, and being able to know what comes next is comforting to them. The same way a strict nap and bedtime schedule gets easier the more consistent we are with following through. Their minds and bodies know what's coming. They are prepared and understand what's about to happen and they are comfortable with it. This is also true with watching a film they know well, they can predict what's coming and how it will make them feel. Research shows that processing the same information repeatedly causes our brains to categorize the information as “good” and we develop a fondness for it (this can happen even if the information we are receiving is bad). If we think about this as adults, we have favorite movies too. There hasn’t been one time that The Notebook or P.S. I Love You has flashed onto my tv while channel surfing and I haven’t stopped to watch it. No matter how much of it I have already missed. It never fails, I still feel my chest tighten when Ellie (Rachel McAdams) begs Noah (Ryan Gosling) to tell her why he left and hadn’t written her back after she wrote him every day for a year… or when Holly (Hilary Swank) reads the last of Gerry’s (Gerard Butler) letters that he left before he died and finds out her mother was the one carrying out his plan. I know you all have movies like this too, they evoke emotion even after all these years and seeing it multiple times. We are drawn to them because we like them sure, but because our brain has filed it in the “fond memories” section of our brains. Kids will even develop a physical attachment to the images, much like a favorite plush toy or a blanket, they feel good, warm, secure in familiarity. On the other side, processing new information takes more energy and more mental focus. It drains us faster (think about a weekend conference or a full day of classes... we are exhausted and barely moved from our seats) Our kids are processing new information all the time! Their rapidly growing minds are in a constant state of learning! After thinking of it this way I can totally understand the desire to watch the same thing over and over. Kids learn best by repetition and are striving to succeed just like we are. It feels good to all of us to finally master something we have been trying to do for a period of time. Kids often show it with much more animation and excitement… I remember not too long ago when our youngest said his first few words, or when he could make it down the steps alone, or when he could build a tower with his blocks… we all cheer for him and he laughs and claps and sometimes even dances. He does the same thing when he watches Dory navigate her way to finding her parents. He knows when a song is coming and when she is going to escape danger and when she is going to find her parents, he claps and cheers and dances for her. It brings him the same satisfaction as if he accomplished those feats himself. Who doesn’t like to succeed? It’s a complete high! In some regards maybe even addicting. The key to understanding… knowing how our kid’s brains work helps us understand them, and in turn, guide them. So maybe always choosing Dory isn’t such a bad thing after all (I may just need to wear some headphones or have my journal handy). As for the obsessive TV time, I think I will start using it as a reward. “If we accomplish a few tasks we can watch Dory before we take a nap” (insert a small defiant cry session) “Let’s play with your blocks, can you show me where your blocks are?” (crying now stops and we are off to find the bucket of blocks in the other room). I have found that not being in the room where the giant black screen of brain cell sucking entertainment is, the less I hear requests for it to display our beloved Dory. 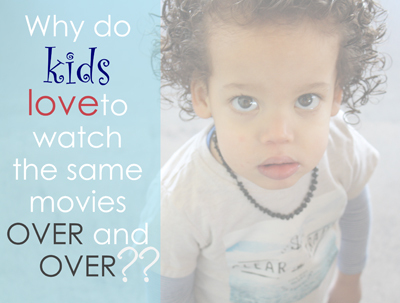 What are your kids watching on repeat? How do you cut down on screen time? Champagne & Laundry is a proud Affiliate of Amazon Associates! Clicking on some of the links found on our website may lead you to purchase from Amazon which earns C&L a small commission. This will not cost you anything! It ensures that we can continue to offer you the products and solutions we love to help make your everyday life a little easier. Thank you!